Jhoulys Chacin combined with three relievers on a six-hitter to give the Milwaukee Brewers their second straight shutout win, 1-0 over the Chicago Cubs on Wednesday afternoon. Chacin (6-1) allowed four hits in six innings, striking out seven and walking four to win his sixth straight decision. Jeremy Jeffress pitched the seventh, Josh Hader struck out the side in the eighth and Cory Knebel worked a perfect ninth inning for his sixth save. 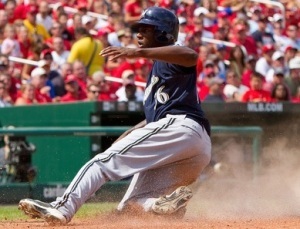 Lorenzo Cain provided the games only run with a third inning home run, his eighth of the season. Mike Montgomery (2-2) took the loss, allowing just two hits in six innings, both by Lorenzo Cain. He struck out four and walked only one in his fourth start since replacing injured Yu Darvish in the rotation. The Brewers improved to 3-8 this season against the Cubs and moved 1 1/2 games in front of the second-place Cubs atop the NL Central. The Brewers are off on Thursday and will open a three-game series against the Philadelphia Phillies on Friday night at Miller Park.